Amsterdam, The Netherlands - A child’s bedroom isn’t just a room, it’s a place to play make-believe, a space to transform into a fortress, or even build a den. Now parents can further enhance their child’s play space and imagination with the addition of the Philips LED candles. The Philips Disney LED candle lights emit a warm glow that emulates the softness and flicker of real candle flames without the worry of hot wax or open flames. Whether a child is a Disney Princess in the making or in love with all things Minnie and Mickey, the relaxing, diffused light will add a hint of magic to play time. Simply tilt the candles to turn them on and off. They are so easy to use, even children can create an enchanted atmosphere in their room all by themselves. USB chargeable, the lights can be fully charged during the day, so they can light up the whole night. Safe to use, the LED technology in the candles means they are cool to the touch and fitted with a Velcro strap to keep wires tidy. Minnie and Mickey Mouse have been inspiring children for generations; Mickey Mouse as a fun, optimistic and mischievous friend whilst Minnie Mouse is the ultimate Disney leading lady. 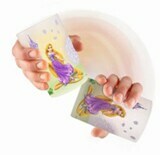 Also available in Disney Princess designs featuring Cinderella, Rapunzel, Sleeping Beauty and Snow White, just what every little princess in training needs to light up her play time and bring story time classics to life. As well as making perfect bedroom accessories, the Philips LED candles allow parents to extend the magic of Disney into their children’s day to day environment. Trend alert: All the candles in the Philips LED range will work perfectly with the pastel colours and candy tones in the children’s room. Top Tip: Use them to create a soft light in your children’s book drawing area. This will enourage them to draw, while being inspired by the Disney characters.